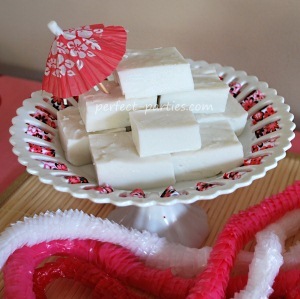 This cool and refreshing treat is a traditional coconut milk based dessert often found at luaus and other local gatherings in Hawaii. Although often referred to as a type of pudding, the consistency of this dessert is similar to jello and is usually served in squares. Combine sugar and cornstarch in bowl. Then add the water and mix. Pour the coconut milk into the pot. Add the cornstarch, sugar and water mixture to the coconut milk in the pot. Cook on medium high heat. Stir frequently. When it boils, stir continuously or it will scorch for one minute and then remove pot from heat. It will thicken quickly during this time. Pour into 9 x 12 pan. Let cool until firm. You can refrigerate it when it cools a bit. Keep refrigerated until use and refrigerate leftovers. Cut with cookie cutters to make fun shapes.